Alrighty guys, as much as I hate to admit it, back to school time has rolled around once again. Personally for me it’s a bit scary, I’m starting my senior year in college – eek! For some, back to school represents a little more quiet time around the house, for others it means entrapment in a classroom and too much time spent on homework, and for the lucky few it represents the excitement of a new, fresh year. Sad as is it to see summer go, going back to school is still a fun time- you get to see your friends, you might get to be the big shots on campus, and you can finally break out your plaid and get ready for some serious leaf stomping. Back to school is also an important time in terms of possessions. No back to school ensemble is complete without the best backpacks, coolest notebooks, and sparkliest pens. 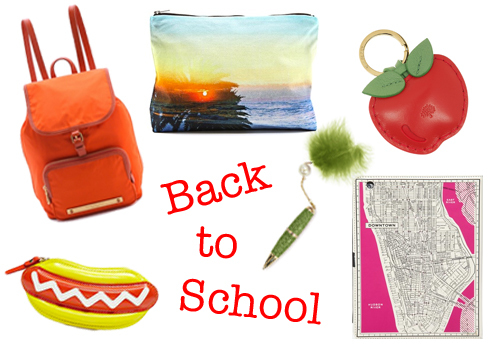 Click on through for forty fabulous back to school accessories. And if you aren’t going back to school, that’s ok too- backpacks are super chic right now, cases shaped like foods are fun, and who doesn’t love a newer, cuter iPhone case? Click through below! Burgundy is pretty much the hottest fall color for the up and coming fall season, and rightly so. This rich tone screams falling leaves and sweater weather, and goes well with cream, camel, black, and dark green. For a color cozy yet supremely sophisticated, look no further. Leather Leggings (4), and the combination of leather and burgundy is pretty killer. Jersey and burgundy is pretty cool too, especially in Helmut Langs Draped Jersey Dress (5). To keep your head and neck warm, or at least stylish, go for a cool hat- Borsalino Hare Velour Hat (6) and a cozy scarf, this Topshop Snood (7) is especially great because a food is by far warmer, so there you go. For more coziness, we move on to sweaters, you can’t go wrong with a turtleneck like Etros Wool Blend Sweater (8), or cashmere, like Uniqlos Cashmere V Neck Sweater in Wine (9). More toasty fashion comes in the form of Haider Ackermans Wool-Blend Felt Coat (10) and the Versus Hooded Shearling Coat (11), which is pretty much the best thing ever. Not much warmth, but fashion for days comes in Haider Ackerman’s Swinton Taroni Jacket (12), which is the next best thing to the Versus coat. If you aren’t ready for this strong color all over your body, try it on just a small part, like your nails with Illamasquas Nail Varnish in Unnatural (13) or NARS nail polish in Chinatown (not pictured). You could also go for a strong lip with Dolce and Gabbanas Classic Cream Lipstick in Dahlia (14). In terms of shoes, there are many, but none so good as the Miu Miu Suede Stud Ankle Boots (15). The CC Skye Warrior Princess Cuff (16) is perfect snippet of the color, while the YSL Large Patent Leather Clutch (17) and 3.1 Phillip Lim Pashli Leather Tote (18) showcase the color a bit more.